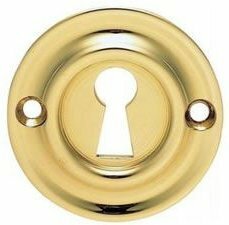 PVD brass key hole cover / escutcheon, 45mm diameter. PVD stainless brass door furniture, a process known as 'Physical Vapour Deposition', is coated in a microscopic layer of hardwearing metals which protects the door furnitures finish from discolouration, even when exposed to harsh coastal areas, sunlight, pollution etc. The protective finish is so hardwearing the door furniture is guaranteed not to tarnish for 25 years.